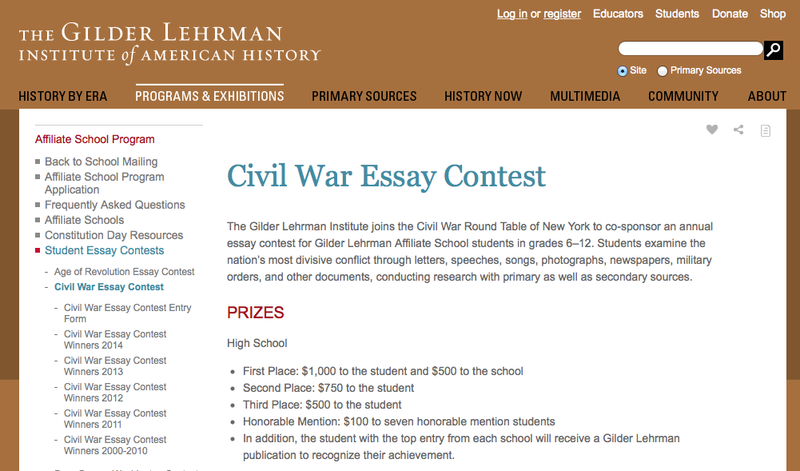 We received news this morning that the Gilder Lehrman Institute (GLI) is co-sponsoring a Civil War Essay Contest with the Civil War Round Table of New York. The contest is open to the GLI's Affiliate Schools and students in grades 6-12. "Students examine the nation’s most divisive conflict through letters, speeches, songs, photographs, newspapers, military orders, and other documents, conducting research with primary as well as secondary sources." Further contest details can be found here. The deadline for submissions is January 30, 2015. The National History Club is holding the Lessons of Leadership Contest. This Spring marks the 150th anniversary of Robert E. Lee’s surrender to Ulysses S. Grant at Appomattox Courthouse, bringing an end to the Civil War that killed over 600,000 Union and Confederate soldiers. This contest invites NHC chapter members to explore the causes, figures, and events of the Civil War. Students are asked to select an historical figure, analyze his/her decision making during the War, and detail how that person influenced the scope of the War and also History in general. Using descriptive examples of challenging decisions or vexing problems that this person had to make or solve, we seek people whose courage and honor can guide us today. An essay of not more than 2,000 words, supplemented with a bibliography and endnotes. Entries may be submitted in either of the following forms: 1) Microsoft Word document or 2) PDF document. A documentary that reflects your ability to communicate your figure’s importance, and also helps you develop skills in using photographs, video, graphic presentations, etc. Documentaries should not exceed more than 10 minutes, and sources used should be credited in an annotated bibliography. A website that reflects your ability to use website design software and computer technology to communicate how your historical figure influenced history. Your website should include a collection of web pages, interconnected with hyperlinks, that presents primary and secondary sources and interactive multimedia. Sources used should be credited in an annotated bibliography. All entries must be received by April 1, 2015. Email to Bob Nasson at rnasson@nationalhistoryclub.org/ Please type Lessons of Leadership in the subject line. Submissions will be judged by the NHC Advisory Board. Winners will be announced at the end of April. The Paul Gagnon Prize will be presented to either a K-12 history teacher who exhibits exceptional historical scholarship or an individual or group that has made a significant contribution to the promotion of history education. The deadline to apply is December 5th. 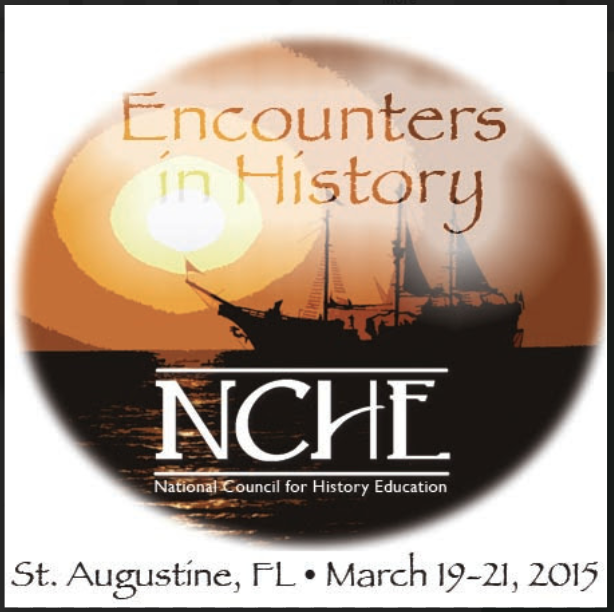 The prize will be presented during the 2015 National Council for History Education (NCHE) Conference in St. Augustine, FL. For more information on the prize and how to apply, go to the link provided. Paper submissions from senior and emerging museum professionals, scholars, and educators are invited for this symposium, which will examine the role of the craft museum in modern culture. Coinciding with the renovation of the Renwick Gallery, the Smithsonian’s national craft museum, this program seeks a lively dialogue on craft’s institutional mission, and the execution of programming devoted to the collection, conservation, presentation, and study of craft. The issue of how to interpret the field of craft in a museum setting is increasingly urgent as the boundaries of its teaching, practice, reception, and the discipline’s very definition shift dramatically in the first quarter of the 21st century. Please submit a 300-word abstract and short CV to Nicholas Bell, The Fleur and Charles Senior Curator of American Craft and Decorative Art, and Nora Atkinson, The Lloyd Herman Curator of Craft, at CraftSymposium@si.edu. On November 29 the Oahu tournaments of the Hawaii History Bee & Bowl were held at Iolani School in Honolulu. In addition, the U.S. Geography Olympiad was also held. History Education Hawaii, Inc., extends its thanks to John Bickel and Iolani School for hosting the event. We are also delighted that David Madden -founder of the National History Bee & Bowl as well as the U.S. Geography Olympiad. Students and organizers alike enjoy the various competitions. Teams and individual students from Iolani School, Punahou School and Pearl City High School participated. The Junior Varsity Division of the Oahu History Bowl was won by Iolani School Team D, followed by Iolani Team F.
The Hawaii History Bee champion was Darwin Peng of Iolani School, followed as runner-up by James Jenkins, also of Iolani School. 1) Brendan Clerenger of Pearl City High School. 2) Darwin Peng of Iolani School. 3) David Pang of Iolani School. 4) Ryan McMichael of Punahou School. 1) Ryan McMichael of Punahou School. 2) Kento Tanaka of Iolani School. 3) Michael Kiang of Punahou School. 4-tied) Darwin Peng and Arjun Srirangarajan, both of Iolani School. Our congratulations to all participant and winners! Since 1840, the governance of Hawaii has been defined by a source document – a constitution. For over a hundred seventy years, the changing of our Constitution has reflected the aspirations, fears, courage, and resiliency of Hawaii's people. 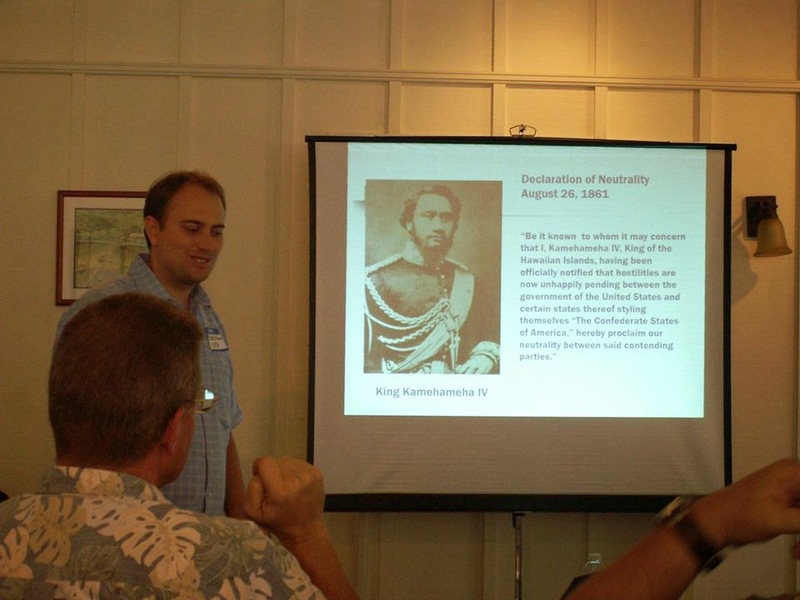 Over the course of two Saturdays in November, the King Kamehameha V Judiciary History Center will provide high school and middle school Social Studies teachers of Hawaii an opportunity to explore the mechanics of constitutional change. How has local reaction to socio-political forces, from within and abroad, affected Hawaii's constitutions? In 2018, Hawaii's voters will decide whether or not to convene a state constitutional convention. What arguments can be made, for and against, a possible constitutional convention? Saturday, November 8, 2014, 9:00 a.m. to 2:30 p.m. In order to understand our current situation and seek the right path going forward, we must look to the time before us. The workshop begins with presentations defining constitutional governance, and exploring Hawaii's constitutions of past along with their historical context. The day concludes with focus on Hawaii's 1978 Constitutional Convention, a watershed moment in Hawaii's constitutional history. Saturday, November 15, 2014, 9:00 a.m. to 2:30 p.m.
Every ten years, Hawaii's voters have the opportunity to vote to convene a Constitutional Convention. The last "Con Con" in Hawaii was held in 1978, resulting in amendments to our state constitution that created the Office of Hawaiian Affairs, declared Olelo Hawaii an official language, provided protections for Hawaii's fragile environment, and affirmed our state's commitment to women's rights. This session begins with a panel of delegates who participated in the historic 1978 Constitutional Convention. Next we explore a range of “hot button” issues that might influence votes for or against future constitutional convention. The day concludes with teaching strategies for the classroom. The National Council for History Education and The Fritz Fischer Scholarship Fund are pleased to offer scholarships to attend the NCHE National Conference! Interested? Please Contact John Csepegi to learn how to apply and what is required of scholarship recipients. john@nche.net or (240) 696-6612. NOTE: The deadline to apply is December 15, 2014. 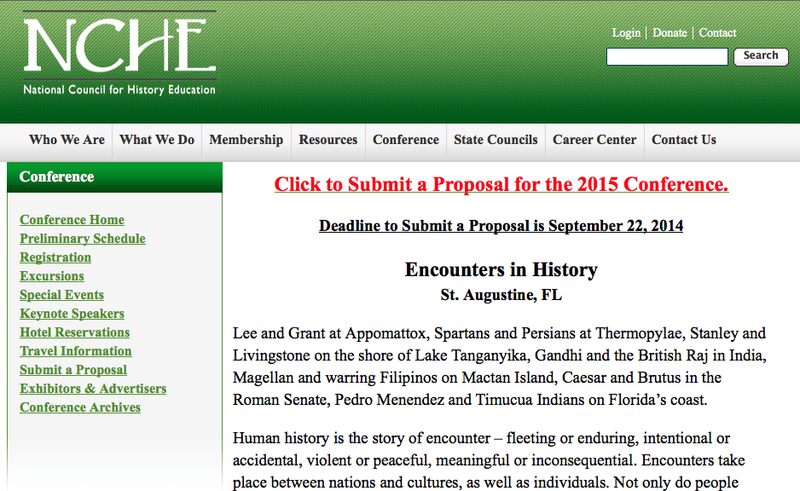 The National Council for History Education (NCHE) has issued a call for proposals for its 2015 annual conference in St. Augustine, Florida. The deadline for submitting proposals is September 22, 2014. To submit your proposal please go to this link. Good luck! Complaints about the College Board's recently released Advanced Placement United States History (APUSH) Framework raise fundamental questions about the nature of history and the responsibility of history educators. Critics list the individuals, groups, institutions and events that go unmentioned in the Framework and decry its "radically revisionist" approach that "emphasizes negative aspects of our nation's history while omitting positive aspects." The process of selecting events, topics, and themes that constitute the content knowledge of a course curriculum has always been, and remains, one that involves the competing interests and values of academics, administrators, and communities. But it is important that educators and policy-makers recognize and acknowledge the protocols, methods, and instructional framework that constitute best practices in the study of history - history's habits of mind. The point of education is not simply to acquire a specific body of information. Lifelong learning requires mastering the tools to continue to grow intellectually throughout life: to learn how to find new information, process it, and share it with others. Since the 1988 report by the Bradley Commission on History in the Schools (which led directly to establishment of the National Council for History Education [NCHE] two years later), history educators have talked and written about historical thinking skills - formulating questions, conducting research, separating fact from fiction, sorting by relevance, arguing from evidence, reporting findings - and sought to integrate them into the teaching of history. The development of state history and social studies standards lent momentum to this movement, and by 2011 nearly 80% of states had standards that incorporated historical thinking skills. NCHE welcomes revision of the APUSH Framework and test in view of the increased emphasis on the teaching and testing of historical thinking. Multiple-choice questions, often derided as "multiple guess," will now relate to historical evidence, such as documents, images, and maps, and require students to reason rather than simply recall. There will be short essays specifically designed to assess proficiency in historical thinking, as well as command of content knowledge. Longer essays, written in response to Document-Based Questions, will also show students' ability to understand, interpret, and apply historical evidence. These skills will serve them well in college and throughout their lives. Of course, historical thinking requires that students have some history to think about, and to that end the APUSH Framework includes a concept outline, but offers teachers considerable latitude in deciding how to flesh it out. Given that latitude, complaints about omissions from, and a political bias in, the Framework seem misplaced. Besides, teaching students how to think for themselves is the best antidote to the dangers cited by APUSH critics. However, the apprehension expressed by teachers who will teach the course and parents whose children will take it requires more attention. The stakes for them can be very high, and the College Board's roll-out of APUSH failed to offer them adequate preparation for, or even information about, the new order. While many teachers participated in AP summer institutes and workshops, many others did not, so how adequately prepared are they? Wouldn't an extensive professional development program - one that offered more lead time - have served everyone better? Is there still time for that? Since the substantial support materials available in past years - sample tests, sample responses, etc. - are now outdated and useless, are teachers sufficiently equipped to do their best work, and can students initially be expected to perform to the same levels as their predecessors? If student AP test performance declines, will colleges and universities accordingly modify their policies for granting course credit? What measures will the College Board undertake to address the concerns and meet the needs of teachers, students, and parents during the school year now underway? What will it do differently in the future? On behalf of its members and in the interest of history education, NCHE is examining these, and related, issues, collecting thoughts from teachers, educators and other interested parties, and weighing how best to address their concerns. NCHE will convey both those concerns and its recommendations for dealing with them to the College Board. In view of the fact that the 2014-15 school year has already begun in many districts, NCHE does not believe that a one-year postponement of the new APUSH format is the best course of action. Instead, NCHE will support teachers and their students in adapting to the new APUSH Framework and test. The National History Club Wants You! 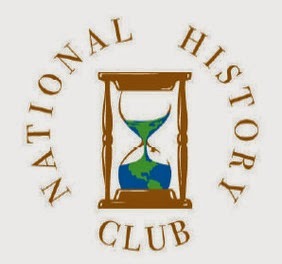 The National History Club Inc. (NHC) inspires students and teachers to start History Club chapters at high schools, middle schools, and within other student and community programs. Members of local History Club chapters participate in local and national programs, and create their own projects and activities. The NHC also provides chapters with resources and services that will help them increase the activity and impact of their History Club. To date, 500+ History Club chapters at high schools and middle schools in 44 states have joined the NHC, and there are over 14,000 student members. When you join the National History Club, you join students and teachers from around the country—and the world—in discovering, learning, reading, writing, teaching, and living history. The NHC's main goal is to bring together students and teachers with a real passion for history, helping them learn from each other's ideas, experiences, and stories, which are distributed through our tri-annual eNewsletter, monthly eUpdates, and other communication methods. We do not limit the scope of activities that a chapter may participate in—each club is allowed to navigate its own course. This allows for a wide-range of really interesting activities that are displayed in each Newsletter and on our website. Schools are free to decide whether their chapter will be a regular History Club (open to all) or a History Honor Society (with specific requirements for induction). The NHC also co-sponsors multiple award programs to recognize outstanding student members, Advisors, and chapters. For more information on the NHC and to find out how to join, please visit its web site here. It's that time again! We just heard the good news for Hawaii history educators from Dale Van Eck, Manager of Educational Partnerships for The Colonial Williamsburg Foundation. 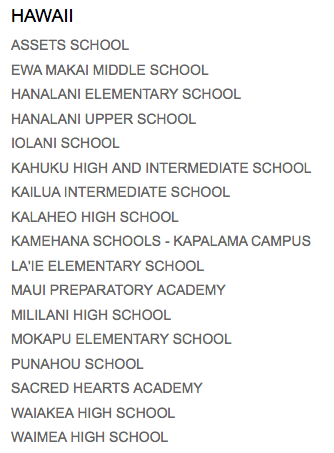 Hawaii public schools are once again eligible to receive FREE electronic field trip programs! In fact, the Foundations has fifty available NOW. 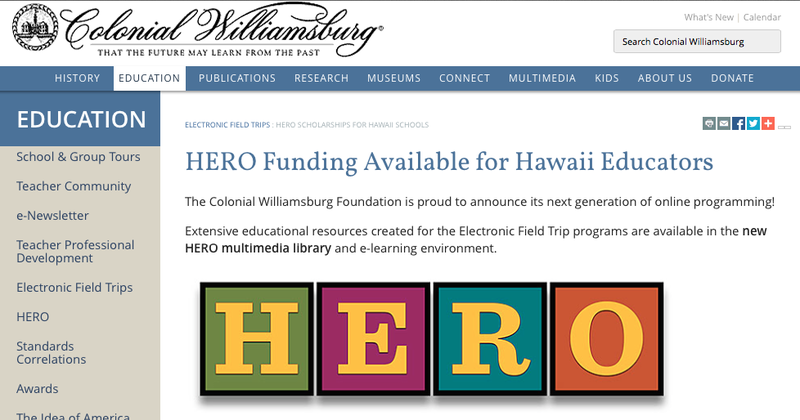 Thanks to a generous Colonial Williamsburg donor, Hawaiian public elementary and middle schools are eligible to receive a full subscription to HERO at no charge (a $250 value per school). Since the subscription is for the entire school building, only one person from each school will need to subscribe. If you have any questions, please contact us at: dvaneck@cwf.org with the subject line HAWAII GRANT or call 1-800-761-8331. When The Times reported that the number of Advanced Placement exams taken in the Los Angeles Unified School District had hit an all-time high, I couldn't help but wonder: Is that a good thing? AP courses help high school students gain admission to prestigious colleges, but not necessarily because of the course work. What matters is getting the AP course on the transcript. Heralded as a civil rights success in some corners, AP classes are really a numbers racket and a way to play the college admissions game. Most colleges reward applicants for taking AP courses, the more the better. Rather than evidence of strong learning or superb college preparation, AP has become a credential that helps students gain access. As a former history teacher with L.A. Unified, I am most familiar with the AP U.S. history exam. It asks students to answer—in 55 minutes—80 multiple-choice questions covering 400 years of history, to respond to two essay questions and a “document-based question” that requires them to weave in material from sources they are seeing for the first time, all in 115 minutes. I'm not really troubled by the skill sets pushed by the latter two components—the ability to decipher a challenging question, make and support an argument, analyze documents and synthesize information—although because the topics aren't announced, teachers must teach as much content as possible to give students a fighting chance. The skill set developed by AP courses seems antithetical to what college life should be—the exploration, deeper understanding and investigation of the world's complexities. I do have a big problem with the multiple-choice portion, which requires students to develop skills of little value—rote memorization and recall under pressure. Content from the pre-Columbian era forward must be covered. “Covered” is the operative word —notanalyzed, evaluated or synthesized, words common to academic and intellectual investigation in a college class. Some teachers teach against the AP test, determined to build in time for deep analysis, connection to present day, critique, writing genres and themes that connect historical movements. The AP system forces much content to be “taught” quickly, which leads to low retention and even less analysis. Students are generally on their own to read, process, understand and remember an outrageous amount of information. I've seen gifted AP teachers who were compelled to reduce the complexity of World War II to two 55-minute classroom lectures, and to cover the New Deal and the civil rights movement in one class. To explain the compression, teachers cite the press of time, the wealth of material and the impending weight and doom of the final AP test, given a full month before the school year ends. There is value in learning to examine complicated content, but the AP test takes it to an extreme. The exam also fails to reward exceptional or powerful writing, preferring a particular style of writing that fits a set rubric. The focus on multiple choice questions reduces complex historical events to “correct” answers: a, b, c or d.
College professors complain about students' inability to write well and their lack of creative thought. Faculty members have told me that students seem so intent on providing the answer they think the professor wants that they all end up writing their essays in much the same way. Students seem uncomfortable with complexity and want professors to guide them to the proper answer. The skill set developed by AP courses seems antithetical to what college life should be: the exploration, deeper understanding and investigation of the world's complexities and uncertainties. As AP courses have expanded, and as universities depend on them to separate and sort applicants, high schools have developed their own skill sets to ensure higher success and pass rates in both the courses and their associated exams. Sadly, the space for more inquiry- and discussion-driven, deeper and more complex learning is all but disappearing. Brian Gibbs taught in LAUSD for 16 years. He is a doctoral candidate in the University of Wisconsin-Madison's School of Education. 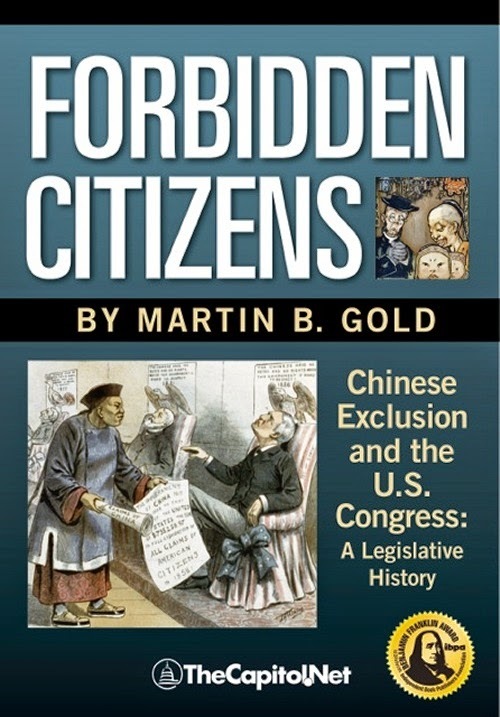 Forbidden Citizens: Chinese Exclusion and the U.S. Congress: A Legislative History recounts the long and shameful history of U.S. laws passed between 1879-1943 that prohibited citizenship for Chinese people. Author and attorney Martin Gold has over 35 years of legislative experience advising Senate Majority Leaders and serving on a number of Senate Committees and is one of the country's leading experts on congressional procedures. This event is free and open to the public today, August 5, 2014, 4:30pm - 5:30pm at the University of Hawaii's Mānoa Architecture Auditorium. A whole class of people, forbidden from ever becoming citizens . . . forbidden from even entering the country-their rights torn up and trampled on, left with no political redress. This was the United States of America from 1882 through 1943-if you had the misfortune to be Chinese. The United States Congress banned all Chinese from becoming U.S. citizens from 1882 through 1943, and stopped most Chinese from even entering the country starting in 1882. Forbidden Citizens recounts this long and shameful legislative history. Congress passed restrictive legislation between 1879 and 1904. The most notorious was the Chinese Exclusion Act of 1882, described as "one of the most vulgar forms of barbarism," by Rep. John Kasson (R-IA) in 1882. These laws were targeted not only at immigration, they banned citizenship, even for legal immigrants who had arrived before the gate was closed in 1882. Barred from becoming voters, the Chinese had no political recourse against repeated discrimination. Because their appearance and lifestyle were so different, it was easy to tyrannize the Chinese. Insisting that the Chinese could not assimilate into American culture, lawmakers actively blocked them from doing so. Democrats and Republicans alike found the Chinese easy prey. For the first time, this book assembles the complete legislative history of Congress's Chinese exclusion. "Our nation has the greatest ideals, standing as that 'city upon a hill' for the world over to look toward with hope. Yet we have not always been as welcoming as we have proclaimed. Forbidden Citizens by Martin Gold tells the story of the exclusion of a specific group, the Chinese people, for racial reasons that were expressed in the most shocking terms. It is thorough, thoughtful, and highly relevant today. This work presents the best scholarship in the most accessible manner." "Through engaging narrative, Forbidden Citizens expertly tells a story unfamiliar to most Americans, one that left a permanent scar upon the psyche of Chinese Americans and changed our nation forever. Martin Gold's thorough and pioneering research into decades of Congressional history brings to life the politics of Chinese exclusion in a way no one has." "Forbidden Citizens is a moving account of a regrettable part of American history. Marty Gold has done us all a service by bringing this story to light so that our past mistakes are never repeated." "An important piece of scholarship, which vividly depicts the intensity of anti-Chinese and anti-Asian feeling that was widespread even among our intellectual and political elite only a century ago." National History Day wants to expand and support professional development for Social Studies teachers, English teachers, and School Librarians across the nation and around the world. For the last twenty years, NHD has developed materials, lessons, and summer institutes to help teachers improve their content knowledge and their strategies for working with students. In an effort to reach a larger number and broader scope of teachers across the nation, NHD has begun offering online professional development – webinars and hangouts designed to help teachers learn from their homes and classrooms. In September 2014, NHD will offer an online graduate course for secondary teachers and librarians who want to implement a project-based curriculum into their secondary classrooms using the framework of the NHD program. The course will provide practical advice as well as pedagogical strategies. Teachers will earn three graduate credits from the University of San Diego while creating classroom-ready materials customized to the needs of their students. The course will run from September 15 to December 15, 2014. Teachers will work on independently-paced modules with weekly deadlines. This allows a teacher to complete his or her work at any time of day from anywhere in the world. The cost of the course is $600, which includes tuition and materials. Enroll now – space is limited. Registration will close on Friday, August 15, 2014. Join us and see how this strategy can revolutionize the teaching of history in your classroom. Note: Each state, school district, and state recognizes credit differently. Please review this course with your school to make sure that credits will be accepted at the end. (Photo credit: Tina Mahina from the 2013 evening tours). 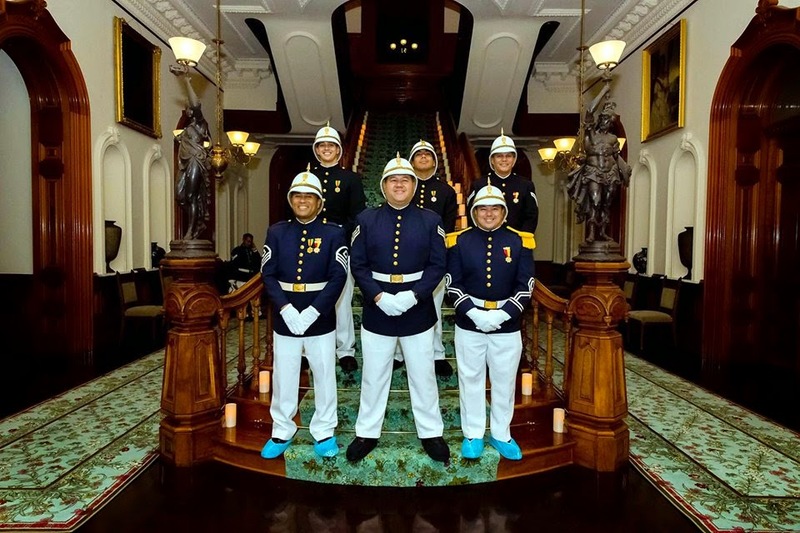 We are pleased to announce the date of the 2014 Queen Kapiolani Evening Tours to celebrate the 180th anniversary of Her Majesty's birth. This special event will be held on Saturday, December 27th from 5:30 pm - 10:00 pm. Please check our website periodically for updates on the entertainment lineup and other info. We just received this note from my good friend and keynote speaker, Brig. Gen. Frances Iwalani Mossman. I wish to share the credit for this with all of the speakers, presenters, museum coordinators and staff, the National Council for History Education, and the officers and directors of History Education Hawaii. I am personally very humbled and appreciative. President, Co-founder of History Education Hawaii, Inc.
You put together a very interesting and productive first conference for the History Education Council of Hawaii. May there be many more such conferences and programs. I very much enjoyed meeting the presenters and attendees at the first day of the conference, which I attended. I am impressed with the important work they are doing and their commitment to education and their students. I plan to follow-up with several people to learn more about their programs. You have been an avid, determined and relentless advocate of the history education vision, purpose and mission from the very beginning. Yes, I clearly remember our early discussions about this program and its potential. Without your vision, dedication and guidance, the History Education Council and program for Hawaii would have died years ago. This year’s conference established the concept and benefits of combining educational presentations with visits to actual historic sites, memorials, and museums. This combination has great potential. Thank you, Jeffrey, for inviting me to be a part of the program and your team of dedicated educators. 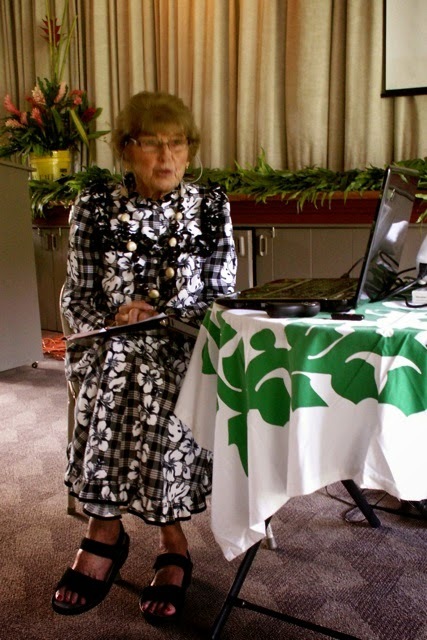 At our recent History Education Summer Conference, Barbara Del Piano of the Daughters of Hawaii and Queen Emma Summer Palace delivered a presentation on the history of historic preservation in Hawaii. Her sideshow presentation at Emmalani Hale featured a rich array of photos of historic building and sites. She is also the recipient of Historic Preservation Hawaii’s Historic Preservation Publication award. The Daughters of Hawai‘i was established in 1903. 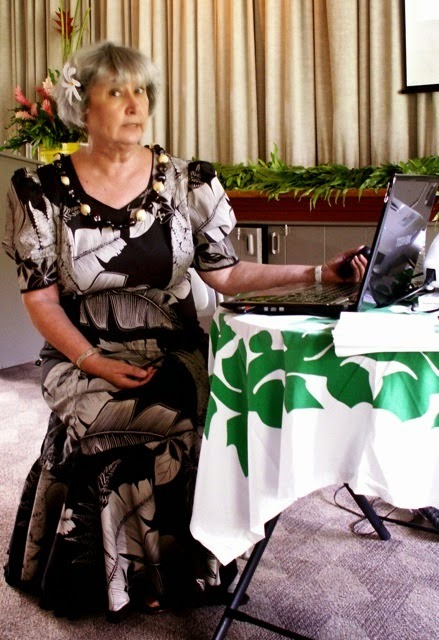 Bonnie Stevens is an historian with Daughters of Hawaii and Queen Emma Summer Palace. On the final day of our History Education Summer Conference she delivered a remarkably detailed presentation on the Battle of Nuuanu. (Also, click here). A few of our attendees -myself included- remarked that it was the most comprehensive history of that battle ever presented to us. Stevens also furnished information on the educational programs offered by Daughters of Hawaii/Queen Emma Summer Palace. Meet Rosanna Fukuda and Mitzie Higa. They co-delivered a presentation at our recent conference titled Getting Students Fired up about History; it is Easier Than You Think. Fukuda is the State Educational Specialist, Social Studies, of the Hawaii State Department of Education. Dr. Mitzie Higa, Ed.D, NBCT is the Curriculum Coordinator/ELL Coordinator of Ewa Makai Middle School. Session attendees participated in a guided guided activity that examined various visual renditions of the Statue of Liberty. This exercise focused on American symbolism. By using a variety of primary and secondary sources, Fukuda and Higa facilitated historical inquiry with attendees as they do with students using the new College, Career, and Civic Life (C3) Framework for Social Studies State Standards. This promotes critical thinking, reading, and writing. Big mahalo Rosanna and Mitzie! This morning we received news from Dr. Justin Vance, the head of the Hawaii Civil War Roundtable. 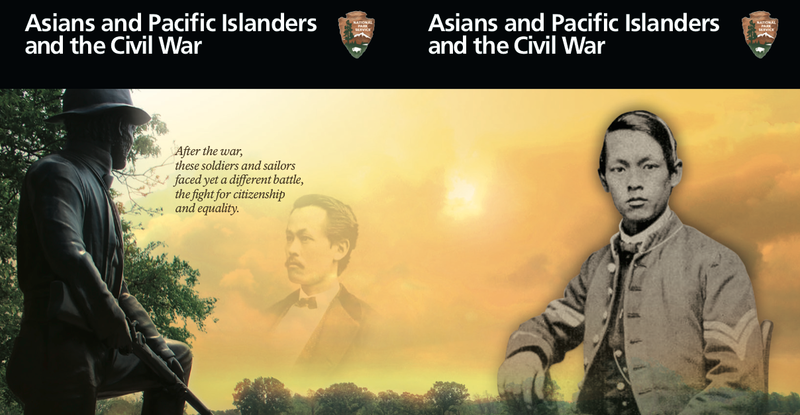 Dr. Vance reported that a National Park Service publication titled Asians and Pacific Islanders and the Civil War will be released this coming winter. The Table of Contents is featured above. 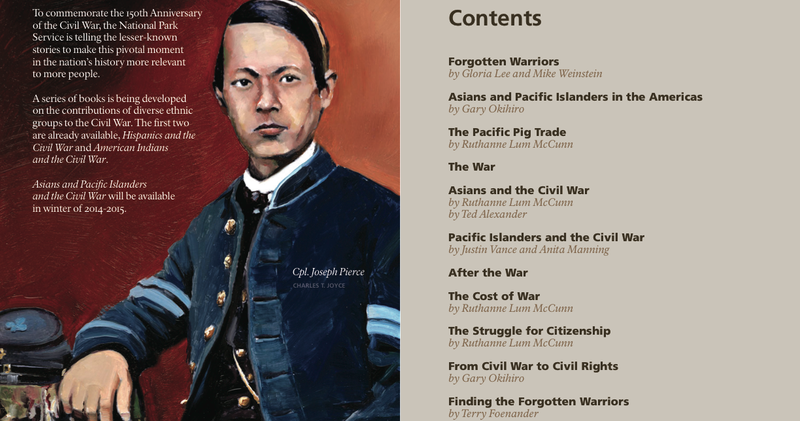 Dr. Vance and Anita Manning contributed to the Hawaii and Pacific Islander section. 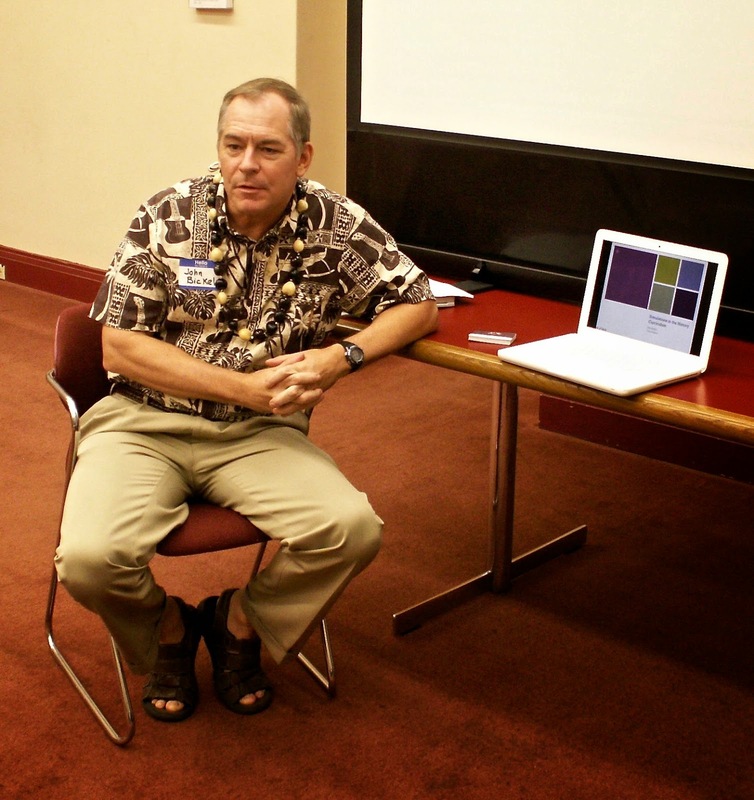 Dr. Vance was one of our session presenters at the History Education Hawaii Summer 2014 Conference co-sponsored by the National Council for History Education. To download your copy of the promotional flyer click this link. Dr. Marc Gilbert, PhD., is the National Endowment for the Humanities (NEH) Endowed Chair of World History at Hawaii Pacific University. He also heads the World History Association of Hawaii at Hawaii. Dr. Gilbert has published extensively as an academic author, co-author, and editor, including World Civilizations: The Global Experience (now in its Seventh edition) and several works on the intersection of Vietnamese and American history. In 1999, Gilbert won a “Silver Telly” Award for a documentary on homeless Vietnam era combat veterans titled Lost Warriors, which he co-wrote and co-produced. He led a session at our recent History Education Summer 2014 Conference on the relevance of world history, emphasizing that history has themes and patterns. Gilbert also discussed how specific problems arise in world history in specific times, and that it effects everyone. An example of this revolves around trans-regional issues, such as food, water, and so on. World history is also interdisciplinary and involves connections between many things. A Semester at Sea: Circumnavigating the World and Teaching World History, was a session at our recent History Education conference led by James Tueller of Brigham Young University-Hawaii. Since 1997, Tueller has been a member of the faculty at BYU-Hawai'i. Before moving to La‘ie, he received his Ph.D. in history at Columbia University in New York City. His presentation focused on the challenges and benefits of teaching and learning in an enclosed shipboard environment and augmented with the in-port experience. He personally participated in this global experience with Semester at Sea (click here) and shared his observations with session attendees. Semester at Sea's "mission, vision, strategy, and core values are rooted in student success and global comparative education," since 1963. Did you know that History Education Hawaii is on Facebook? All are welcomed! We like to post news of events, historical anniversaries, interesting articles and so forth. Group members are always invited to do the same. It's all free, of course! Just click here to see our group page and join! Here's Cherylle Morrow of Chez Morrow International. 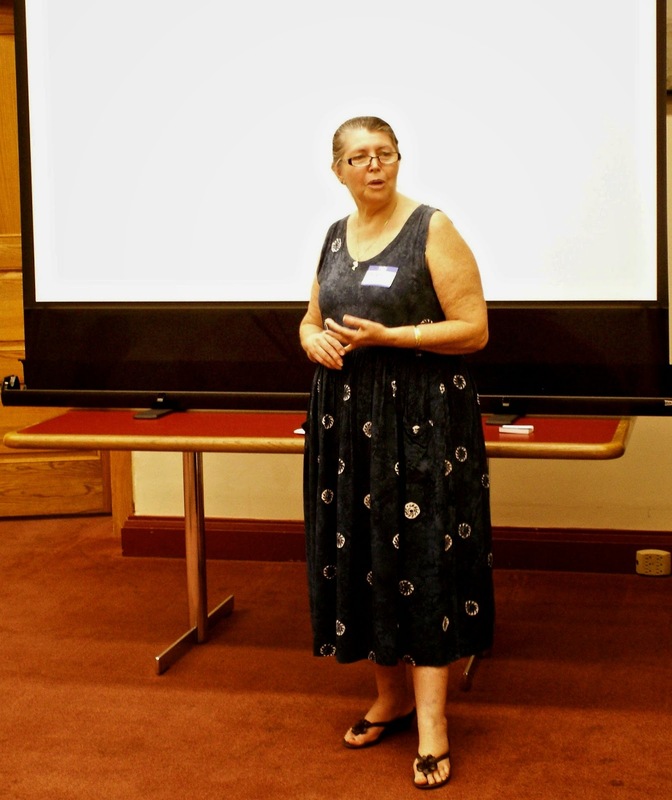 She delivered her 'Tax Talk for Teachers' presentation this past Friday at the History Education Hawaii Summer 2014 Conference. It was co-sponsored by the National Council for History Education. Cherylle pointed out that many of the changes in the U.S. tax code effect educators, students, scholars and researchers. She is the former program director of the Hawaii Women's Business Center. Cherylle offered constructive suggestions on how to benefit from those tax code changes. For over ten years, Morrow was the program director and business development specialist with the Hawaii Women’s Business Center. She was responsible for the U.S. Small Business Administration (SBA), The Office of Women's Business Ownership (OWBO) program. After Hawaii's schools have returned from summer break a similar tax workshop for educators across all disciplines will be held. It will be organized by The Pacific Learning Consortium, Inc.
John W. Bickel, a history teacher at Iolani School in Honolulu, was named the 2014 Hawaii History Educator of the Year. The announcement was made at the first-ever History Education Summer Conference on June 13. The conference was held by History Education Hawaii, Inc., the Hawaii council for the National Council for History Education (NCHE). Bickel delivered a well-received presentation on the effective development, use and application of simulations in history instruction at the conference. 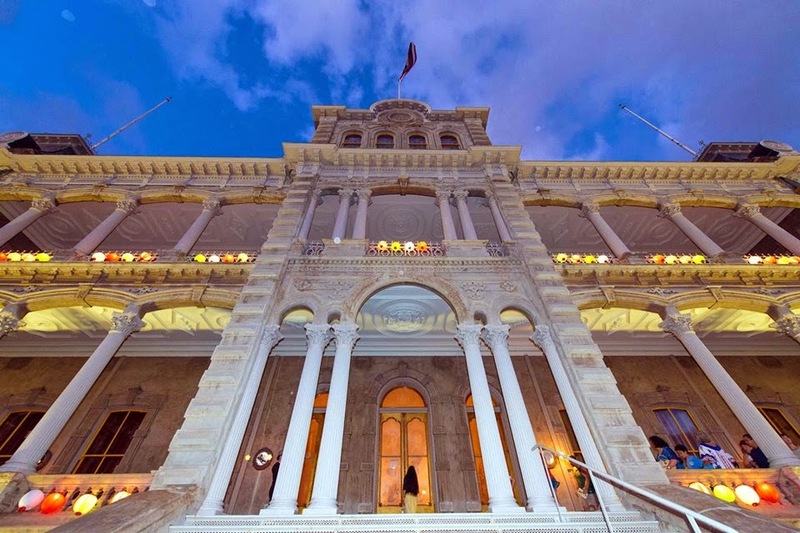 The session was held in the Old Archives Building next to Iolani Palace. A graduate of the College of William and Mary and the University of California at Berkeley, Bickel has been a dynamic history teacher in Hawaii’s public and private schools for many years. Presently, he is well-respected history teacher at Iolani School. Iolani School was founded in 1863 as the preeminent school of the former Anglican Church of Hawaii. The school was patronized by Kamehameha IV (Alexander Liholiho) and Queen Emma, who gave the school its name in 1870. The name ‘Iolani’ means “heavenly hawk” in the Hawaiian language. Iolani School is one of the largest private schools in the United States of America. Besides teaching history courses, John W, Bickel has served as the Hawaii coordinator of the annual Hawaii History Bee and Bowl since History Education Hawaii adopted this program in 2012. A team of Iolani School coached by Bickel recently tied third place in the 2014 National History Bee and Bowl. “John Bickel is a tough history teacher,” said Jeffrey Bingham Mead, president and co-founder of History Education Hawaii.